In a large dutch oven, melt the butter over medium heat. Add the celery, onion, and bell pepper. Cook until tender. Add the ground beef and cook until cooked through. Drain excess grease away. Return the mixture to the pot and over medium heat, add the garlic. Cook 1 minute. Add in the tomatoes with the the juice, the bloody mary mix, beans, chili powder, cumin, and smoked paprika. Bring to a boil, then reduce the heat to low. Add salt and pepper to taste. Cover and simmer for 1 hour - stirring occasionally. When ready to serve, stir in the horseradish. 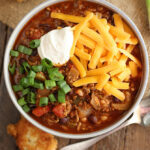 Serve topped grated cheddar cheese, sour cream, green onions, or your other favorite chili toppings.